Happy (almost) Valentine’s Day! Do you have any traditions surrounding this much divided holiday? I realize a lot of people throw old St. Valentine a lot of shade, but I’m not one of those. Back in my single-lady-daze I would make all of my girlfriends snarky Valentine’s and we’d do dinner or something else fun. These days, we NEVER go out on the actual day. We celebrate our anniversary of dating (TEN years this year, ya’ll!) this Valentine’s day because I invited Sean to my lady-date thing (why?! so dumb) which was at a Mexican restaurant (Bertha Miranda’s in Reno, to be exact) and I remember asking a girl in the hall of my dorm if my outfit was cute ’cause I was nervous even though there was like a whole girl gang and lone old Sean. I mean I really like-liked him! Anyway, we haven’t actually gone out since then because we are total hermits and love to either get take-out (Chinese! eaten from the carton) or make something at home and eat it on the couch and watch something we’ve DVR’d…which I realize is super romantic, I know…but, makes Valentine’s Day this year as parents SUPER easy and exactly no different than years before. We’ll save the going out for, like, a weekday in March or something. Anyway, CUPCAKES! 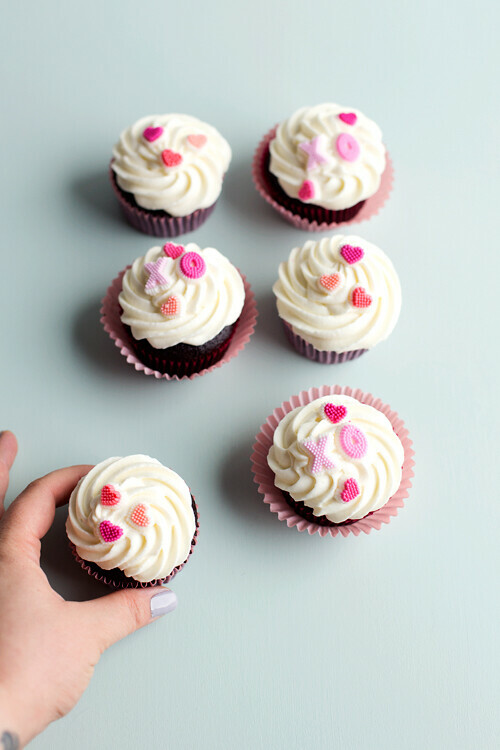 I made these cupcakes after failing that cake I mentioned last week–which was pink velvet and totally delish for the record, but a disaster and just didn’t feel like me…whatever that means. So, I re-worked it into something, I think, is truly magical. There are 3 parts to this cupcake dream. First, the chocolate cake base. Dudes, these cupcakes are my favorite ever. They make exactly 12 cupcakes and come together with just one bowl and a measuring glass. I came up with this recipe a few years ago (for these PB+chocolate guys) and it’s my perfect cupcake. Tender and moist with a fine crumb and perfectly domed tops. Second, there’s a goat cheese frosting! Think classic cream cheese frosting with the tang of goat cheese. It’s our new household favorite and I imagine it would be amazing on carrot cake. Third, the filling is a mix of the frosting with some cherry jam. I realize I’m missing a photo of the jammy middles, but there’s evidence of them on my Instagram…pinky swear. I mixed the jam with some of the frosting because I really dislike what happens when jam meets cake and then just sits there bleeding into one another. Some people are into it, I’m not. I imagine you could just spoon some jam in there and call it a day and they’d still be super delicious. 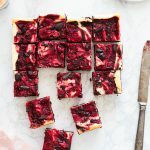 All of the flavors together works super well–rich chocolate, fruity cherry, and tangy goat cheese. 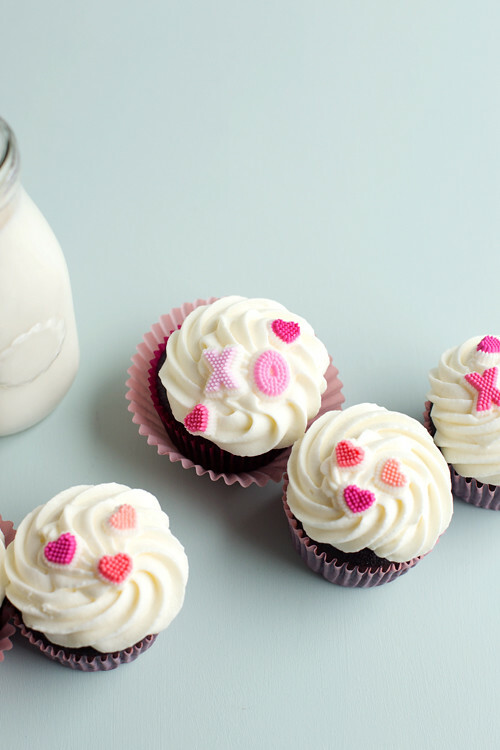 These are definitely cupcakes worth sharing with people you not only like, but you like-like. Preheat the oven to 350ºF land line a 12-cup muffin tin with paper liners. In a mixing bowl, whisk together all of the dry ingredients for the cupcakes. Whisk measure out the oil and buttermilk in a large measuring cup and whisk together along with the eggs and vanilla. Add the buttermilk mixture to the dry mixture in the mixing bowl and fold until combined. Divide the batter between the lined muffin cups, filling each about 3/4 full. 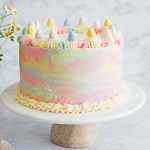 Bake in the center of the oven for about 25 minutes, or until a toothpick in the center of a cupcake comes out clean and the tops of the cakes spring back to the touch. Remove from the oven and cool completely on a wire rack before frosting. 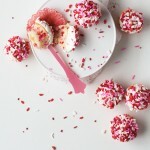 The cupcakes can be made 1 day ahead and stored, cooled, in an airtight container at room temperature. Before frosting, scoop out small wells in the centers of the cupcakes, I used a melon baller for this task, leaving about a 1/2 inch rim around all sides of the cupcake. You can use a pairing knife for this, as well. For the frosting, beat together the butter, cream cheese, and goat cheese until combined. Gradually add in the confectioners sugar until combined well. The frosting should be soft, but hold it’s shape enough to pipe. If it’s too loose, add more confectioners sugar (1/4 cup at a time) until desired consistency is reached. Scoop 1/4 cup of the frosting into a small bowl and stir together with the cherry jam. Fill the wells you made in the cupcakes with the cherry jam and frosting mixture. Either pipe or, carefully spread, the remaining frosting onto the cupcakes, making sure to conceal the filling. Decorate with sugar decorations or sprinkles, if you want. Cuuutttteeee!!! and yay for 10 years!! Can you ship these to Atlanta? These are so cute!!! Hahah yeah, your observation about how as you get older, nobody goes out for Valentine’s Day anymore is totally true. My boyfriend and I spend all our vdays ordering papa john’s and watching netflix, whassup. It’s such a pain how every restaurant in PDX turns their menu into prix fixe/pay a mini fortune! Hell, yes! Netflix and pizza are meant to be. 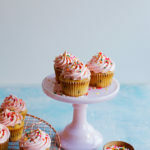 I totally like-like these cupcakes! 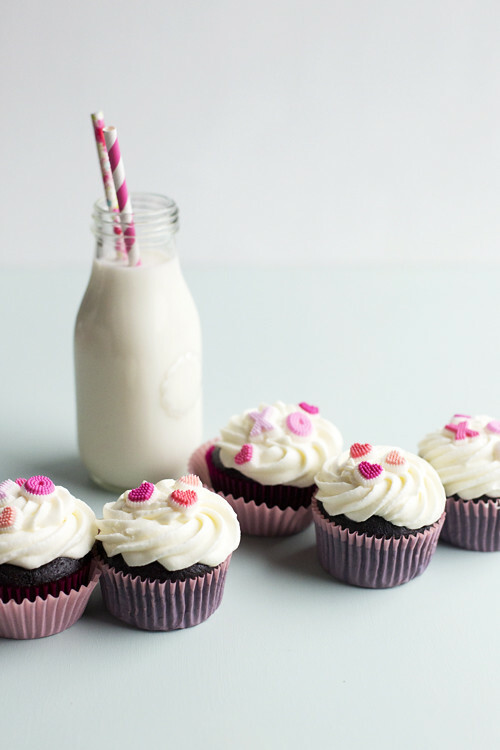 And we are all about the Netflix + takeout on Valentine’s Day, too… ain’t nobody got time for that overpriced pre fixe menu stuff (and none of them would have anything near as yummy as these cupcakes anyway). Yum! The frosting sounds delicious! Going out on Valentine’s Day sounds like a crazy idea! Bertha’s! Love me some Bertha’s. I also love the sound of goat cheese frosting. I’d eat that all day long. And the cupcakes are CUTE. I’m also not into the anti-Valentine’s Day shade. Not everything is about you, fellow single people, GAWSH. 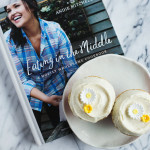 Oh I am so in like-like with these cupcakes! 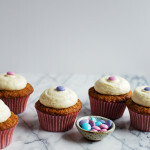 The goat cheese frosting is winning me over! These are so precious! Love them with the old fashioned milk jug! Haha, your story reminds me of my first Valentine’s meal with Chris. I didn’t exactly invite him to a lady date, but I was so nervous and kept asking my roommates if I looked presentable. Then at dinner, he asked me to be his girlfriend after prefacing, “I heard from so and so that you Americans need to ask each other to be boyfriend and girlfriend.” I almost died from laughing. If we were at home, we totally would have pulled the “let’s order Chinese takeout” card, too! These cupcakes are absolutely adorable and I LOVE the goat cheese in the frosting. I wouldn’t want to share these! Goat cheese and cherries and chocolate, yum! I love a sophisticated cupcake!